January marks the start of the new year, the shortest day has passed and the days are lengthening, will be some time before we see any effect. Cold days with heavy frosts and snow are a feature of the month. As winter progresses food is scarce for wildlife, any snow on the ground compounds the problem. There are fewer berries such as Holly, Rowan Hawthorn on the branches in the hedgerows. Birds are active after dawn foraging for food and hour before sunset eating in readiness for the long night ahead. This is a good time to feed birds as they will appreciate a meal and you may be rewarded by seeing other species such as Bullfinch as their need for food makes them less timid. Redwing and Fieldfare which migrated from Northern Europe to winter in Britain can be seen. 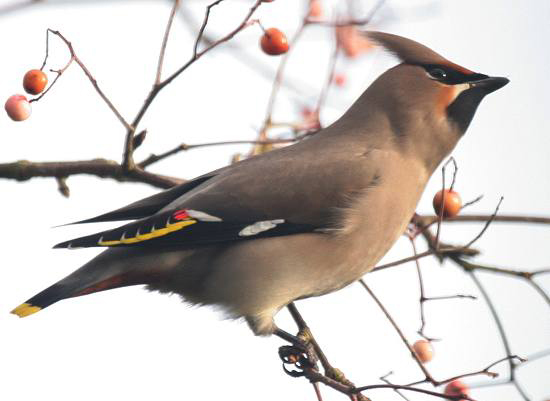 If you are lucky you may also see Waxwings; a winter visitor from Russia and Northern Europe. They are usually spotted where berries such as Rowan are found. For young ducks its fine weather, - An a rare month for tanning leather. Tis winter time, ye swains, injoy yer store, Forget yer hardships and recreate the more.